Once upon a time, long ago and far away near a small airfield in the Northeast Corner of Ohio, this young and inexperienced pilot trainees, learns a lesson that will serve him well for a lifetime. On the morning of my second lesson, my original primary flight instructor, John Gregus had asked me to be at the airport early since he needed to go to work at his real job at 10:00 AM. So by 8:00 o’clock I had the preflight completed and ready to go. As with every second lesson, we were going out to learn to climb, turn, glide and stall. Not long after takeoff, without notice, John reached over and pulled the throttle to idle. “Okay, your just had an simulated engine failure, where are you going to land?” John asked calmly. My answer wasn’t so calm; in fact my answer was just one note below soprano. I pointed out a field just ahead and John said he had the airplane. He continued this approach down to near tree top level. As I glanced out my side window I saw a man, still in his pajamas, coffee cup in hand, with a “What’s going on here” look on his face and we glided over his back yard. Well John said, pushing the throttle in and bringing the engine back to it’s full 108-hp, and started climbing back to altitude, “you wouldn’t have made the field without taking out the fence, but it was a good example of how you must always be prepared, and always have a second option if the first isn’t completely successful. In this case you want to aim between the fence posts and try to hit the fence itself so not come through the cabin. Note, lesson well learned. Still early in my flight career, I was hooked on the books by Frank Kingston Smith. As I have written about often, Frank was my hero and mentor. On one his early training flights he had in his Cessna 140 his instructor, Angelo had him continually reduce power to find out what the minimum rpm the airplane needed to sustain level flight and make a note of that RPM. Again this lesson was also “well learned” and I have duplicated this assignment in nearly every airplane I have flown. It may seem clichéd, but I have always made of practice of continually looking for a spot to land, in fact I made a game out of it. I have always been amused at how when the terrain gets rougher and the landing sites get shorter and narrower, you assumed skills get better and better and you picture getting into a tighter place. To some folks it may seem that this is paranoia, but to me it is just precaution. With these facts in mind let’s skip ahead to the present. I have always talked about my numerous flights in Pegasus to the Sun ‘N Fun Fly-in. Without fail, I plan my trip over and over again, being prepared for my trip. This year was no different, the trip down went flawlessly and as the norm, the trip home was a challenge. Normally the challenge is weather, but this year even though I thought the trip would be a meteorologically challenge, the test came from another direction. There were strong storms across central Florida during the night before launch. It took until 10:30 for the ceiling to lift to even a minimum VFR conditions. 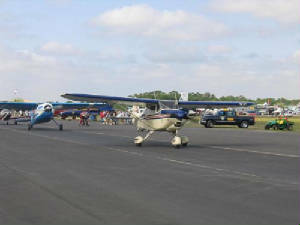 The taxi itself for takeoff from Lakeland Linder was nearly a hour. I had topped the right tank just before leaving my Vintage parking place. As per my obsessed preflight procedures, my last action was to step on my stool and make a final twist on the fuel caps. My plan was to fly on the right tank until empty, since some of the fuel in that tank was auto fuel that was added in February. I like to make sure that my "mo gas" fuel ins alwaysfresh, less than ninet day old. I had just crossed into Georgia and ready to make the trip over the "big swamp" towards Baxley, Ga. I had just descended from above the puffy clouds skirting just below them after hearing some to the other pilots telling about the ceiling closing in deeper into Georgia. As I sensed the first signs of fuel starvation and swapped tanks. The power came back to full song, but to my surprise, after about twenty seconds the RPM started to drop. I pumped the throttle and once again the power returned, but again not for long. It got my attention real fast and I really sat up and got on the stick. I started my scan for places to land if this continues. Again the power came back to about 1800, and from my past studies, that is just below the point needed to maintain altitude. Every time I pumped the throttle the power returned temporarily. I noted that Davis Field at Folkston, Georgia was about sixteen miles away, so I turned to and headed there. There were plenty of dirt access roads if I needed to set it down, but how long would it take to get help out there? As I continued on I noticed a long straight road heading out to the swamp. There was no traffic along the route, and I patrolled a two-mile stretch and saw there were no power lines crossing during that stretch. I made a sudden executive decision that even though in my present condition with pumping the throttle, I should be able to make that airport, but what if the condition worsens? I knew that Rt. 301 in that area is heavily traveled, so lets land and find the problem. It went just like John said it would, because I had the time to be prepared. I saw a van coming over a rise about a half-mile away, I flashed my landing light and he cleared the way. As I passed by they all waved at me. I taxied into a Logging company parking lot, turned around and parked near the road. I shut the engine down, climbed out and called the Sheriff on 911. After explaining my story the dispatcher passed my information to the FAA before sending out an officer to assist me. My next job was to investigate the problem. Upon checking the right wing, I saw a problem. No fuel cap. Apparently when replacing the cap, a rubber gasket that keeps rain water out of the wing was crimped in between the cap and the filler neck. Even when I did my final check the cap felt tight. Now I didn’t wait for him to ask twice, so I sent the fire truck down the road about a 1½-mile down the road. I taxied out to meet him and once again did a full, extended run-up. Then when everything checked out I made a long take-off run. I kept Pegasus nailed to the road for nearly a mile at 85 mph trying once again to make the power drop, but it didn’t fail. I pulled up sharply to get up and above trees and the power lines in a hurry. I flew back over my safety crews on the ground rocked my wings as a salute, and continued the trip to the next airport. I stopped every hour for the rest of the trip, not trusting to put any extra fuel in that right tank with the non-aviation fuel cap. After all I didn’t know if it would vent properly, and I didn’t care to make two unscheduled landings for fuel starvation with full plenty of fuel on board, on the same day. All in all, I credit good training, good practices, and good luck for the safe conclusion to a sticky situation. I thank God for sending me a guardian angle that day, and instructor John for sending me out to fly4fun with such good habits well over forty years ago.